Well said Michael. I couldn’t agree more. Nice one…the Sidecar is definitely one of my favorites. A worthy post for a worthy cocktail. I’d say .5 Cointreau, .5 simple for everything in the family. Mellows out the citrus and let’s the base spirit come forward a little more. Thank you–what a thoughtful response to my question! I was just expected a few suggestions not a post. I’ll see how the Sidecar goes. Thanks again! Honestly? Thank you! Your question was well-timed; I knew to expect the Edible Rhody piece to publish this week. If anyone who reads it actually finds this blog, I’m sure some of them will be as new to cocktails as you are, and I hope this post will help them too. I was pretty delighted by the serendipity, since it gave me a great excuse to get some good content up for new readers. Take care, and I hope you love the Sidecar! Excellent post! The Sidecar was Penny’s introduction to proper cocktails, too. It was a hit & she’s never looked back, thank goodness. I tend to mix them 1 1/2 brandy, 3/4 cointreau and 3/4 lemon, with a sugar rim & a homemade maraschino cherry. It’s rather sweet for me, but Penny likes it that way. I finally got a chance to order a Sidecar. And you know what? It wasn’t bad at all. When I looked at your recipe, I thought it would be boozier than I would like. 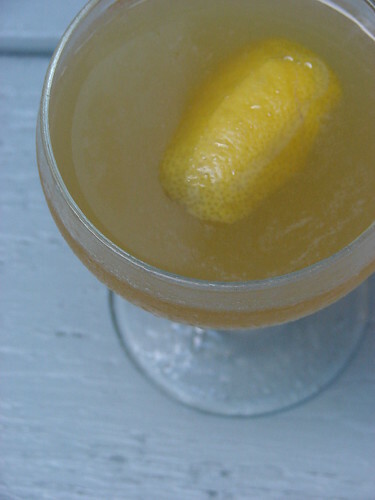 But I found out that I enjoy the tartness and citrusiness, although the one I had seemed was mostly lemony, no orange. Anyway, this was a fun start. Cheers!